OVEREADY and TorchLAB are well known for churning out incredibly powerful yet compact LED lighting products. 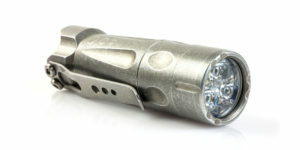 The latest result of their efforts is the new Moddoolar Triple V5 Wasp Head, a little powerhouse of a flashlight rated to produce nearly 3500 lumens using three Cree XP-L emitters..
It’s not all about the power as the Triple V5 Wasp is can also operate at the other extreme, with outputs as low as 0.18 lumens. For those who would prefer improved color rendering, a neutral tinted version with Nichia 219B emitters (1600 lumens) will also be available. The Triple V5 Wasp boasts a feature set that is just as impressive, including a striking open air design, web based programming, modular design, and the ability to work with a variety of battery configurations. It even has a low-powered red LED suitable for signalling or low light activities. 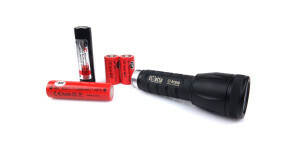 The Triple V5 Wasp head may be purchased separately, as an easy upgrade for existing owners of Moddoolar flashlight bodies, or as part of a complete turnkey flashlight. It comes with either black or natural gray hard anodized finishes and there are a variety of bezel options available. Pricing starts in the vicinity of $250 and varies according to which options are chosen. A triple XP-L version with natural gray finish and stainless steel bezel was provided by OVEREADY for testing. Since it can be used on a variety of different Moddoolar bodies, this review will focus mainly on the head itself. The intricate open air design is both eye catching and functional. Nine equidistant flats form the perimeter of the head which is almost completely hollow, save for a small stem in the center. The open design allows air to move freely through the head and carry heat away from the LED and electronics. 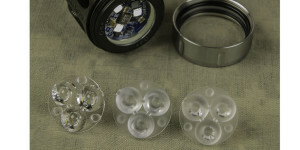 A smooth stainless steel bezel caps off this review sample and holds the ultra clear glass lens in place. The bezel is the same design used on previous generations of Moddoolar heads which means there will be plenty of options available for different finishes and styles. Removing the bezel exposes the optic which is held in place by the glass lens. An O-ring inside the bezel helps ensure a watertight seal. Once the lens and bezel are out of the way, the optic simply pops out to reveal the board and its three Cree XP-L emitters. The design is user serviceable to allow easy upgrades as new boards or optics become available. At the other end of the head, gold-plated copper connectors and a silver plated beryllium copper spring provide a low resistance path between the batteries and electronics. The frame which holds the optic is custom molded from glow in the dark material. After brief operation of the Triple V5 Wasp or exposure to other strong light sources, the GITD material is plenty bright to find the light in a dark room or even illuminate objects at very close distances. The Triple V5 Wasp is fully compatible with all existing Moddoolar bodies and tailcaps, enabling a virtually unlimited number of configurations based upon need and preference. The natural gray anodized finish matched perfectly with my TL50 slim body and Diamondback tailcap. In its most compact configuration, the Triple V5 Wasp can be powered by a single 18350 lithium-ion battery using the TL20 “Shorty” cell tube and Zero Rez Shorty tailcap insert. The resulting package is just slightly longer (and much better looking) than an alkaline “D” cell battery. The Triple V5 Wasp was delivered with “DLMH” (Dim/Low/Medium/High) programming, just one of the many available pre-programmed options available. After turning the light on, the various modes are accessed by a quick off/on cycle, with the mode advancing each time. If the default programming is not to their liking, users can go as far as they want with regard to customizing the operating modes. To begin with, there are two separate sets (banks) of operating modes which can be programmed independently of each other. By taking advantage of the Triple V5 Wasp’s ability to detect the battery configuration, this allows one bank to be used for single battery set-ups and the other for dual battery configurations. The light can even be programmed to use CR123a primary batteries at lower output levels. Programming is accomplished through a web-based interface where users are able to select their desired battery configurations and from 1 to 4 operating modes for each one. To avoid damage to the batteries, maximum white output is limited to 17W (Level 28, 55%) with a single lithium-ion rechargeable battery and 8.8W (Level 25, 29%) when powered by two CR123a lithium primary batteries. In addition to the operating modes, users may select additional options that affect how the Triple V5 Wasp operates. No memory (default) – When first turned on, the light will always start with the first mode. Standard memory – When first turned on, the light will start with the last mode used. Hybrid memory – When first turned on, the light will start with the last mode used but, when modes are changed, it will go back to the first mode. Active (default) – The light will completely shut off when the battery voltage drops to 2.8V per cell. This is for protection against over discharging unprotected lithium-ion batteries. Disabled – This option should only be used with protected lithium-ion batteries or CR123a primary batteries. Active (default) – When battery voltage drops to 3.2V per cell, the light will automatically reduce output to extend runtime. Disabled – The light will attempt to provide the maximum output the batteries can sustain. Runtime will be reduced. Bounce Switch (3 options) – The Bounce Switch is a safety feature that, when activated, can detect reflected light and automatically switch the Triple V5 Wasp to the low-powered red output mode. This is useful, for example, if the light is accidentally activated while being carried in a pocket. No change – Leave the Bounce Switch setting in its current state. Active – Activates the Bounce Switch and allows the user to adjust its sensitivity. Once configuration is complete, the Triple V5 Wasp is held close to the computer monitor where it is programmed by a rapid flashing light sequence. The programming sequence can also be downloaded as a video file for use offline or with mobile devices. Needless to say the Triple V5 Wasp was built for performance. It has extremely strong output and produces a very broad beam with a defined hotspot and bright spill. The beam is generally “floody” but by virtue of its brute strength is capable of respectable reach to well over 100 yards. The XP-L emitters have a fairly neutral/warm tint. 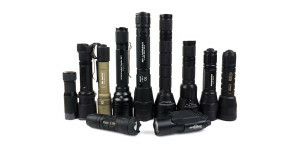 The following slides show the Triple V5 Wasp compared to a variety of other lights to give some perspective with regard to output, beam profile, and tint. The images can be compared across their full width using the slider and additional comparisons can be viewed using the navigation buttons in the bottom-right corner of each image. In the first set of photos, the Triple V5 Wasp is powered by a pair of AW 18650 IMR batteries at level 33 (30W, 100%). For the next set of photos the Triple V5 Wasp was powered by a single AW 18650 ICR battery at level 28 (17W, 55%). The Triple V5 Wasp has an operating range of 2.5 to 8.8 volts allowing it to be powered by either one or two lithium-ion rechargeable batteries or two CR123a lithium primary cells. Due to the heavy current draw when using rechargeable batteries, 18350 IMR batteries are the recommended minimum size. 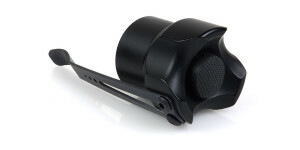 The Wasp utilizes active thermal management to keep temperatures within the head at a safe level. Rather than using timed step downs, the Triple V5 Wasp monitors the internal temperature and, as it approaches 65° C (149° F), begins to reduce output just enough to keep the temperature in check. When operated at the higher output levels this ensures the light is always producing its maximum safe output. Because of this thermal management runtimes can vary greatly depending upon the amount of airflow through the head. With good airflow, output will remain high and runtimes will be shorter. When airflow is restricted, output will decrease and runtimes will grow longer. No single test will be representative of every real world scenario. A series of tests were conducted using a variety of battery configurations to give some idea of what can be expected from the Triple V5 Wasp. The following battery configurations were tested. The first graph demonstrates the effect thermal management has on runtime and clearly shows that good airflow permits much higher sustained output. The Battery Stretch feature can also have a significant effect on runtime as shown in this next graph. The Battery Stretch feature had a minimal affect on the “full power” runtime but allowed the light to continue producing ever decreasing amounts of light as the batteries were depleted. With Stretch enabled the AW 18350 cells ran for 76 minutes before shutting off and the 18650 cells lasted for 2 hours and 25 minutes. The final graph shows a few additional tests which were conducted with fan cooling provided and Battery Stretch turned off. The higher-capacity AW 18650 3400mAh cells provided a nice increase in runtime in both single and dual cell configurations. The Triple V5 Wasp also performed well at a lower output level when powered by a pair of Battery Station CR123a batteries although there was a brief period of pulsing output at around the 33 minute mark. With nearly 3500 lumens on tap, the Triple V5 Wasp is certainly remarkable for its power. However it is also one of the most versatile light engines on the market with a veritable laundry list of additional features and capabilities. 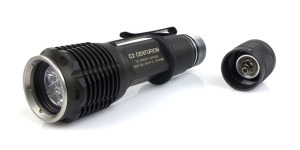 As a flashlight nut it’s easy to get caught up in the gaudy output numbers this engine is capable of producing but that misses the fact that it is still an extremely powerful light for its size when operated at a fraction of its maximum output. As a user I can see the effectiveness of the lower output levels and appreciate the greatly increased runtime they provide. The Triple V5 Wasp has been reliable over the course of the review period, as an EDC light in both the single and double 18350 configurations and through more than 18 hours of runtime testing. The fit, finish, and quality of machining have all been top notch, as I have come to expect from TorchLAB products. The web based programming utility has been easy to use and is one of the Wasp’s greatest attributes. No longer are we stuck with a single configuration even though our needs or preferences may change. Looking for simple single mode operation? No problem. Want every flashing and blinking mode available? You’re covered. Or if you want anything between the two, that’s possible as well. As technology advances, some people are prone to ask, “how much is too much?” To this question, the folks at OVEREADY would respond, “too much is almost enough.” Whether or not the Triple V5 Wasp represents “too much” is open to debate but, for a flashlight this size, it’s certainly getting close within the constraints of today’s technology. I remember thinking the same thing about other flashlights in the past so it’s good to know the Wasp head is designed for easy upgrades. I’m looking forward to seeing what the future holds! Limited availability. The Wasp heads are produced and made available in batches so patience and luck are sometimes needed to get one. What are your thoughts about the Moddoolar Triple V5 Wasp? Leave a comment below or join the discussion at CandlePower Forums. Posted in Flashlight Reviews, OVEREADY and tagged Flashlight Upgrades, LED Flashlight Reviews, Moddoolar, OVEREADY, TorchLAB.